Russell: the Journal of Bertrand Russell Studies is published semiannually, in the summer and the winter, by The Bertrand Russell Research Centre, McMaster University. Both print and electronic editions are published. 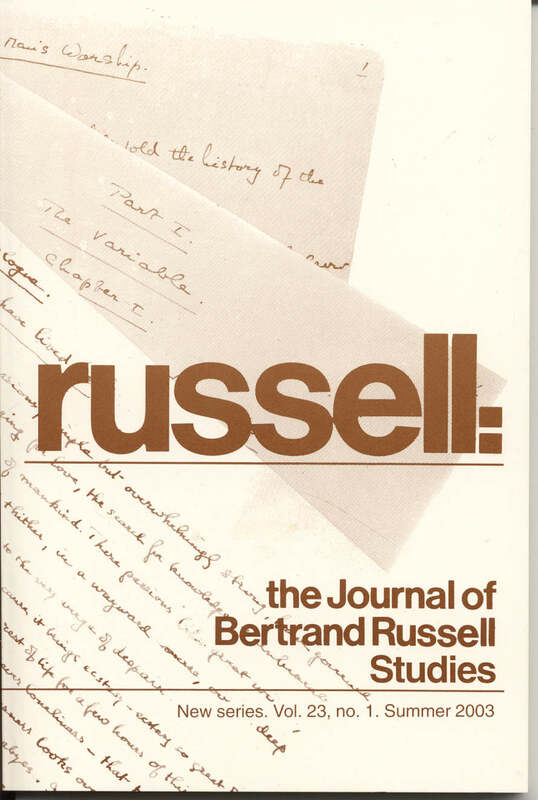 From 1971 until 1999 Russell was titled Russell: the Journal of the Bertrand Russell Archives and was published first by McMaster University Library Press (1971–96) and then by McMaster University Press (1997–99). The ISSN of the print edition is 0036-0163; that of the electronic edition, 1913-8032. Russell is published with the assistance of grants from the Aid to Journals programme of the Social Sciences and Humanities Research Council of Canada and from McMaster’s Faculty of Humanities. Open Access applies to all but the last 4 issues online, the moving wall being 2 years. Russell is a scholarly journal devoted to the study of all aspects of Bertrand Russell’s thought, as well as his life, times and influence. In addition to publishing original research on Russell and reviews of new books about him, Russell also publishes from time to time new texts and textual studies, bibliographies, discussions, indexes, and archival lists. Scholarly articles submitted to the journal are reviewed anonymously. Russell is not the organ of any association or institution. The current table of contents may be consulted. Russell is indexed in The Philosopher’s Index, Arts & Humanities Citation Index, and La Répertoire bibliographique de la philosophie. Russell’s own index is published quinquennially; its online 25-year index was published in n.s. 15 (winter 1995–96). The latest five-year index and the previous one are also online. Manuscripts (in PDF or MS Word) and books for review should be addressed to The Editor. Scholarly papers are refereed by the double-blind method, so identification of the author must be removable. After acceptance, final manuscripts should be submitted electronically in MS Word, with true footnotes but minimal formatting and coding and with doublespacing (including quotations, notes and references). If there are symbols, include a PDF. Citations should use, where applicable, the abbreviations for frequently cited works in Russell Studies on the last pages of this issue. Authors will be sent page proofs for correction. Rates for 2019 are US$140 for institutions plus $17 shipping, and US$70 for individuals plus $10 shipping. Canadian rates are Cdn$140 for institutions and Cdn$70 for individuals, plus $10 shipping. There is a surcharge for institutions of $48 for the electronic edition. Members of The Bertrand Russell Society are entitled to a subscription in their annual membership. Single issues of Russell cost half. Most back issues are available. Page maintained by Arlene Duncan. Last updated 1 February 2019.